Spicy chicken jambalaya is the BEST New Orleans party food, perfect for feeding a crowd during Mardi Gras or for family and friends anytime. 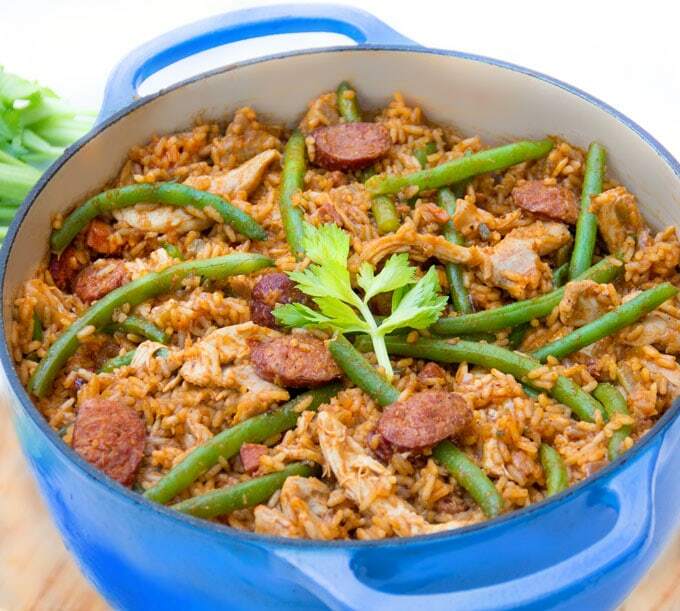 This chicken jambalaya recipe is easy to cook at home and includes nutritious green beans for a well-rounded one pot dinner. This post is sponsored by McCormick in conjunction with a social media campaign through Sunday Supper LLC. All opinions are my own, always. I’ve been traveling to New Orleans at least once a year for the past six years, ever since two of my sons went off to college there at Tulane. It’s such a fun town, with its amazing jazz scene and a celebratory atmosphere everywhere you turn. The main attraction for me (beyond seeing my boys) is the food. How can I describe the unique deliciousness of NOLA cuisine? Comforting, exciting, festive, sophisticated yet totally unpretentious, and (there’s really no other word for it) delicious!! During carnival season and culminating with Mardi Gras the fun and festivity intensifies, with colorful parades, dazzling floats, masked balls, secret societies with kings and queens, beads flying through the air, all-day cocktail parties, and the best food you can imagine. Jambalaya is a signature dish of New Orleans and it is a particular favorite around Mardi Gras since it’s perfect for parties! 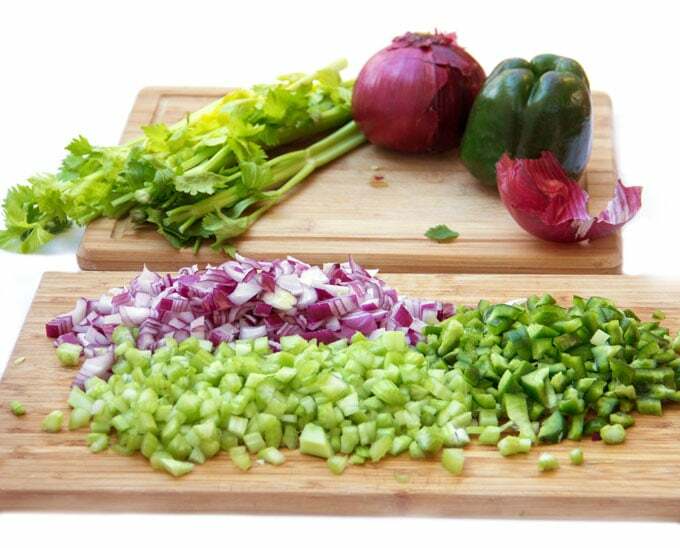 One of the keys to fine New Orleans cooking is known as the “holy trinity” – a sauté of chopped onions, green peppers and celery that creates the essential flavor component of most creole and cajun dishes. What makes the holy trinity even better is that it’s usually sautéed in the fat rendered from the meats that have been sautéed first! The other critical component of New Orleans deliciousness is the unique combination of spices. 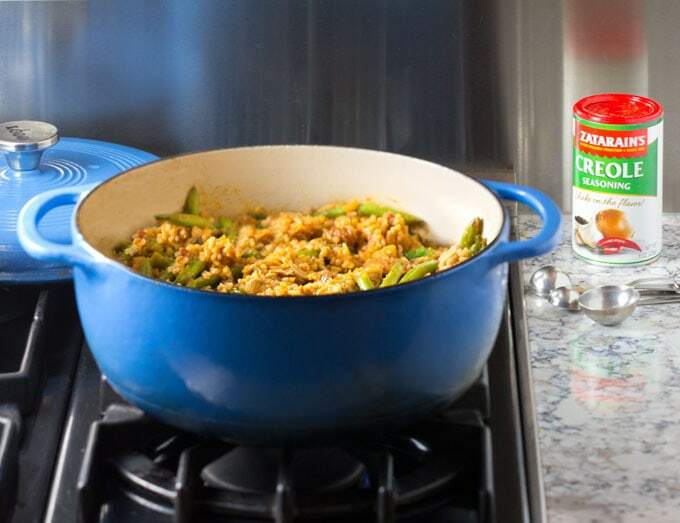 For this recipe I partnered with Zatarain’s – New Orleans preeminent food and spice company, so it was easy to get the authentic flavor excitement I was looking for in my jambalaya. I used Zatarain’s Creole seasoning. 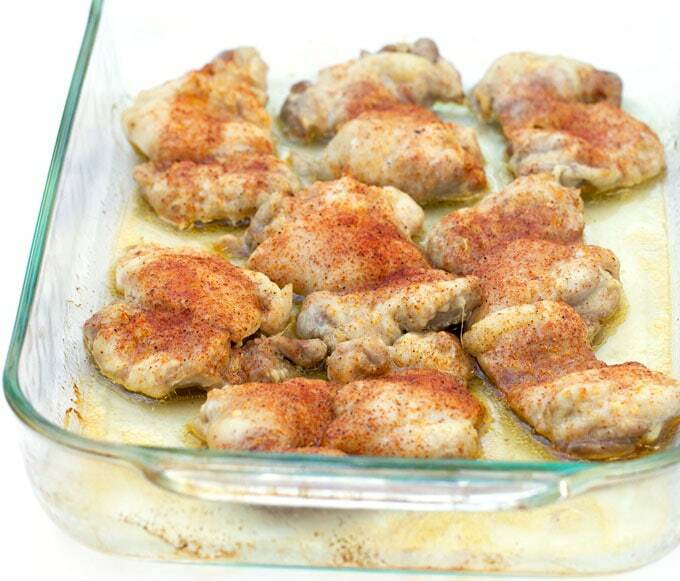 I started by sprinkling it on boneless, skinless chicken thighs, and baking the flavor right into the chicken. The Creole seasoning has a good balance of essential Creole flavors: smokiness, saltiness, garlic, onion, umami and a spicy kick from ground chili peppers. I also used Zatarain’s Creole seasoning to flavor the rice as it simmered in broth with the holy trinity. There’s no official recipe for jambalaya. Every cook has his or her own twist. It most often includes rice and either chicken, shrimp, sausage or all three. But, as you will find out at the end of this post, there are limitless creative ways to reinvent this delicious dish. For my version I decided on boneless chicken thighs, smoky sausages and ham, for a nice balance of flavors and textures. I added green beans because I always love to find delicious ways to include healthy vegetables in my recipes. I also think they look great next to the orange colored rice and sausages. By the way, despite my kids attending college in New Orleans for the last six years, I’ve never visited during Mardi Gras. Our kids always talked us out of it, bringing up the crowds, the debauchery, the issue of safety – I think the real reason is they can have enough fun without us there or perhaps they can have more fun without us there? I hope to experience Mardi Gras some day, but in the meantime I’m going to cook up some spicy chicken jambalaya and get into the carnival spirit. Food is a major focus of Mardi Gras and whether you celebrate in New Orleans or anywhere else in the world, you can cook up a big pot of insanely delicious New Orleans style jambalaya and get your own party started! If you can’t find Zatarain’s spices in your local market, you can order Zatarain’s Creole seasoning on Amazon, as I did. Also, Zatarain’s will help you find their products in your local markets. Just visit the contact page on the Zatarain’s website where you can call or email them for information. You can also connect with Zatarain’s on Facebook, Twitter, Instagram and Pinterest to keep up with all of their tasty New Orleans recipes, products, and cooking inspiration. 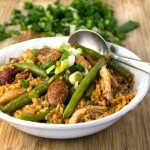 Here’s the recipe for Spicy Chicken Jambalaya with Sausages and Green Beans. As always, I’m hoping you’ll cook this and then come back and let me know what you think! 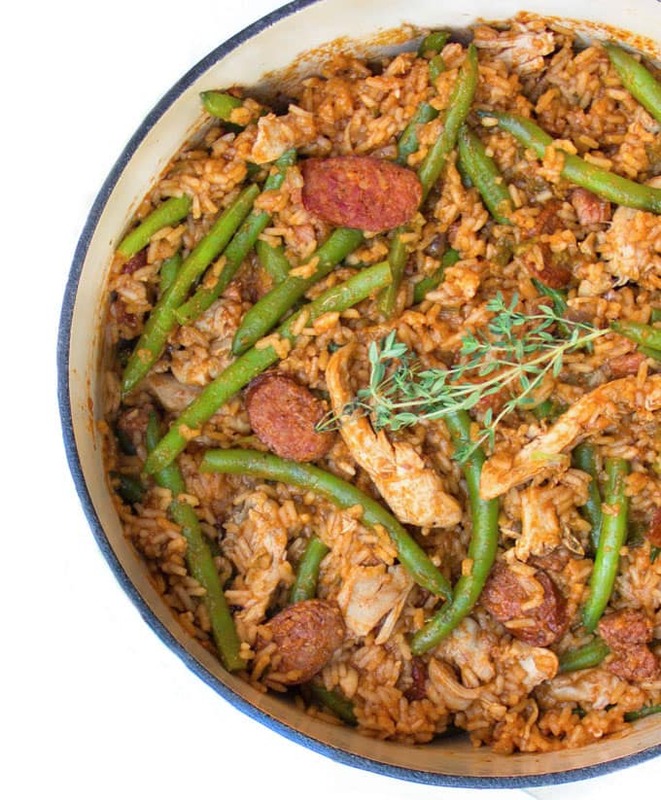 A smoky, comforting, deliciously spiced one-pot wonder with rice, chicken, sausage, and green beans. Roast the Chicken: Preheat oven to 425ºF. Place chicken in a large roasting pan. Drizzle with 2 tablespoons olive oil. Flip each piece to coat and sprinkle evenly with 2 teaspoons Zatarain’s Creole seasoning. Roast for 20 minutes. Shred and set aside. Blanch the Green Beans: Bring a large pot of salted water to a boil. Add the green beans. When the pot returns to a boil, set the timer for 2 minutes. Drain the beans and plunge them into a big bowl of ice water to stop the cooking process and preserve their bright green color. Drain and set aside. 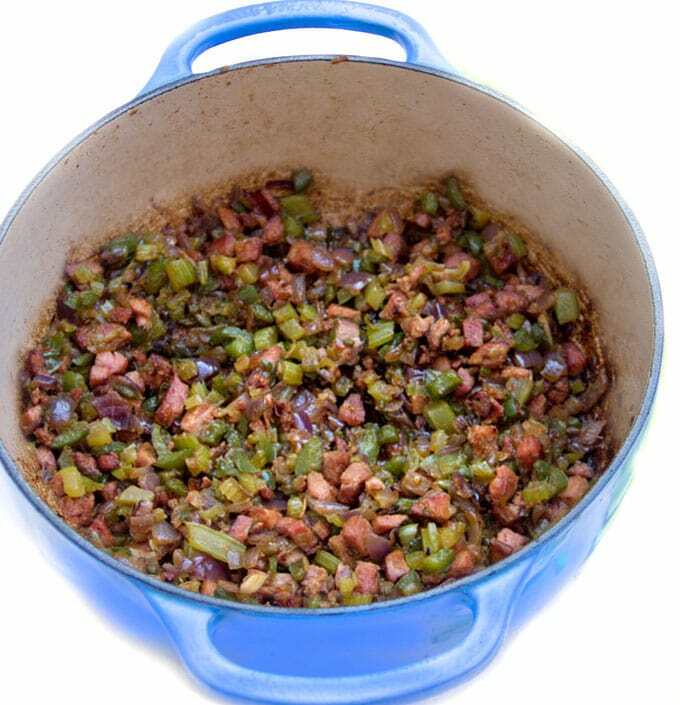 Start the Jambalaya: Heat 1 tablespoon of oil in a large Dutch oven or paella pan with a cover. Brown the sliced sausages for 6-7 minutes over medium-high heat. Transfer them to a plate. Add the chopped sausage and ham to the pot and brown them for 5 minutes, stirring often. Add the onions, green pepper, celery and garlic the pot. Cook, stirring frequently, for about 8 minutes, until the vegetables soften and start to brown. Add the tomato paste and cook, stirring constantly, for 2 minutes or so, until the tomato paste starts to darken and caramelize. Pour in the rice and cook, tossing to coat, for a minute. Add 6 cups of broth, 1 tablespoon of Zatarain’s Creole seasoning, and thyme. Stir to combine. Bring to a boil. Lower to a simmer. Cover and cook for 12 minutes. Stir in shredded chicken and sliced sausages. Cover and simmer for 6 minutes longer. Stir in blanched green beans. Cook for another minute or two, uncovered, tossing to heat the beans and bring it all together. *Thin with additional broth, if you like. To Serve: Serve hot. Scoop into bowls. Top with a generous sprinkling of green onions and pass the hot sauce around. *Note: To reheat add a cup or so of broth or water and heat on medium low, covered, stirring occasionally, until hot. Follow the Sunday Supper jambalaya Pinterest board for a visual library of fabulous jambalaya recipes. recipe/version of this iconic dish. Fantastic! What a stunning dish! Love the addition of green beans! I love the addition of green beans in your jambalaya. I love NOLA cuisine, but to be honest, I find it a little low on veggies, so extra veggies in this dish really speaks to me! 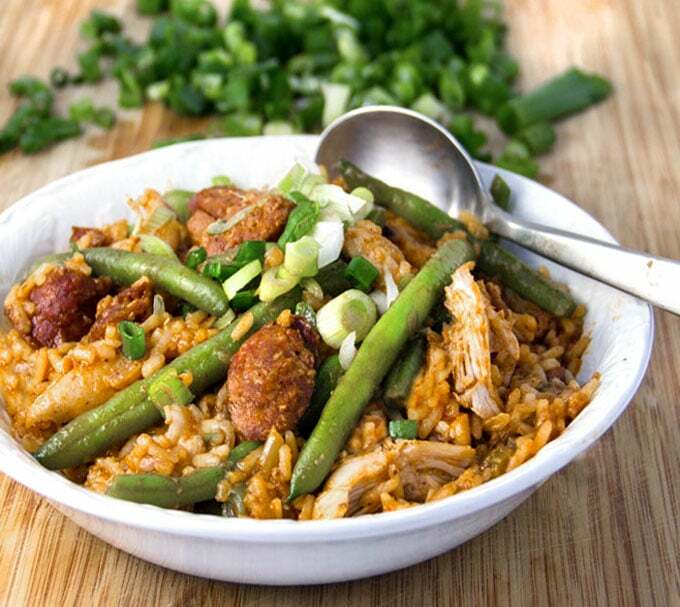 I always forget how much we love jambalaya until I see one that looks this good! Loving your meat and veggie choices! What a delicious pot of jambalaya! This looks amazing! Curious what you might substitute if a family were pescatarian!